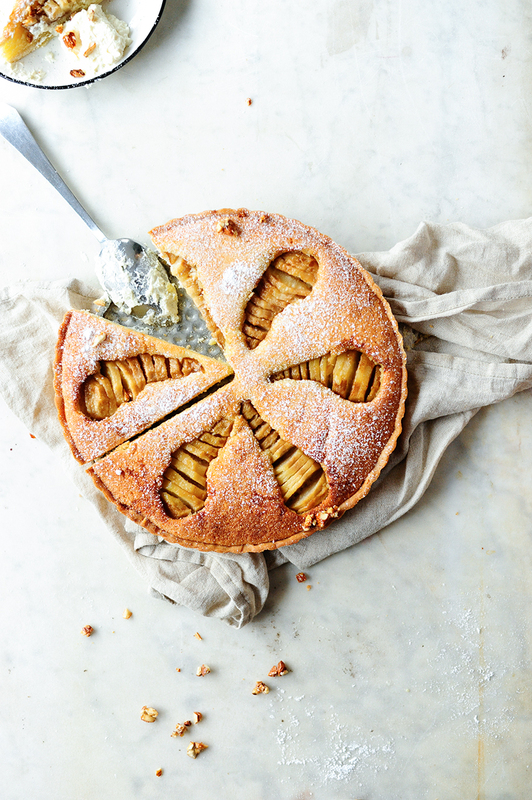 Almond pie with boozy ginger pears and amaretto honey whipped cream. This is a french style pear cake with almond filling, delicious, easy to make and not overly sweet. 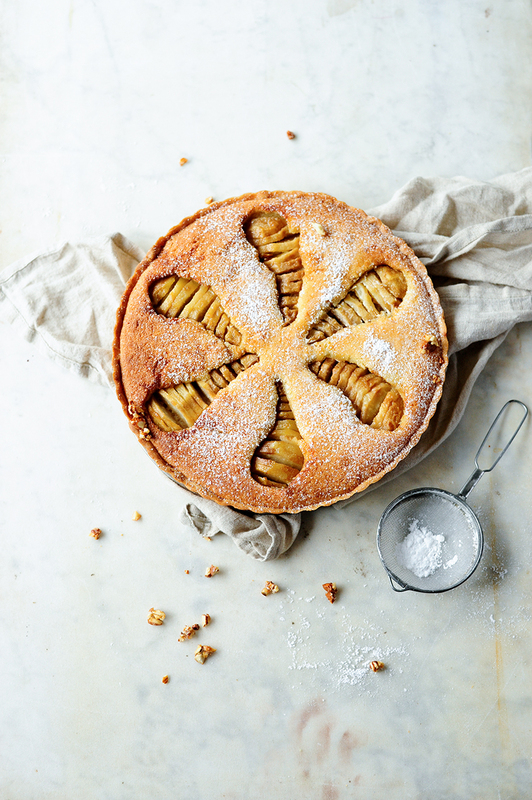 What makes the pie stand out, is the addition of ginger and amaretto. 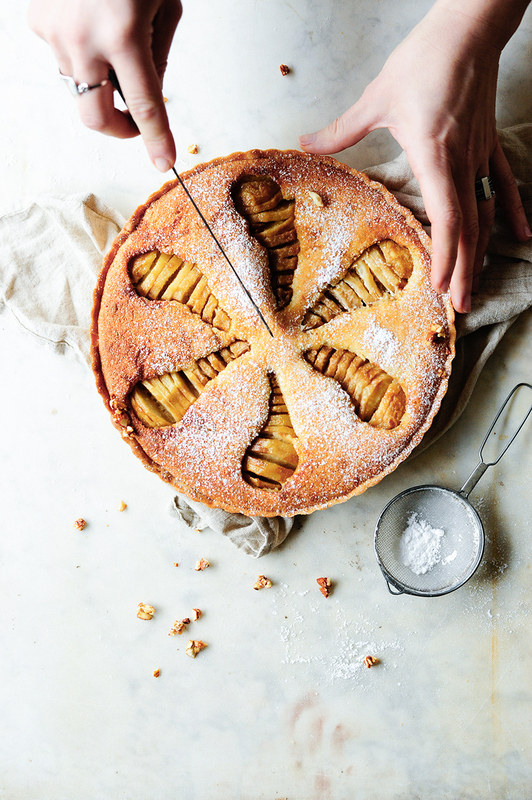 It’s not traditional in french frangipane style cakes, but it really kicks the pie up a lot. It adds a little touch of spice and flavor, but don’t overwhelm the almond taste. To finish off the pie, I made a delicious amaretto honey whipped cream, which creates the perfect sweet and creamy balance. So let’s all bake up this delicious pear cake. In a large bowl, stir the butter with sugar, salt and flour. In a separate bowl, whisk the egg, add 25 g to the bowl with the butter and knead the dough. Chill for 30 minutes. Remove the dough from the fridge. Grease a 23 cm pie pan and sprinkle with flour. Roll out the dough and place into the pan. Prick with a fork, cover with baking paper and add weight. Bake for 10 minutes at 180°C, then remove the weight and the paper. In the mean time, peel the pears, cut in half and core. Stir brown sugar, water, amaretto and ginger in a medium skillet over medium heat until smooth. Bring to a boil, add pears and cook for 3 minutes, flip and cook for 3 minutes more. Set aside. In a large bowl, whisk the egg and add the remaining egg from the crust. Combine with butter, sugar, ground almonds, potato starch, vanilla seeds, ginger and lemon zest, stir until smooth. Pour the mixture into the baked crust. Cut the pears into thin strips and decorate the pie. Transfer the pie to the oven and bake for 30-35 minutes or until golden brown. Remove from the oven and let cool. Combine the almonds with the honey and place on a baking sheet. Bake in the oven for 10 minutes at 180°C. Pour the cream into a bowl and whip until soft peaks form. Add honey, amaretto and vanilla, whip once more until combined and fluffy. 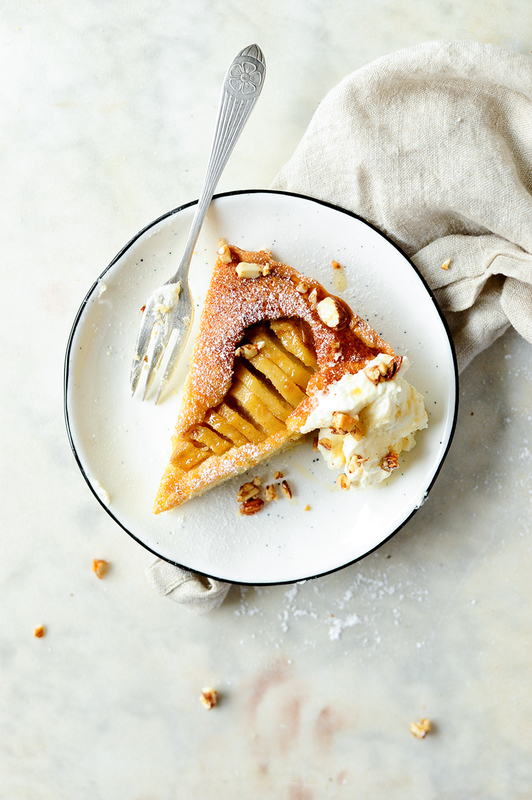 When ready, serve the pie with amaretto whipped cream and sprinkle with roasted almonds. Enjoy! Room temperature sugar? I think you meant butter for the almond cake. yes, it was the butter!! thanks, Evy! Can this be made gluten free without the crust? you can use ground almonds instead of flour for the crust, the pie will be gluten free. Just use the same amounts. Enjoy the recipe!